Odd, it works for me. China tested a domestically-produced drone aircraft designed to disperse smog on Saturday, official media reported, in an important step for the country's domestic aviation industry. "Don’t think your government would poison its own citizens? Think again, this is business as usual for those in power. Criminal biological experimentation like the tests outlined in the short 4 minute video below are routine for the US government, this is not a matter of opinion, but is rather a historical fact. Now, with the ongoing spraying of the entire planet with toxic metals and chemicals through the climate engineering programs, we are all literally being poisoned day in and day out. Many of the materials being sprayed over our heads have already been identified by numerous lab tests from around the globe, this mix of toxic metals is quite lethal by itself. Consider this, at any point in time those in power can put a pathogen in the “climate engineering” mix that could mean game over for us all. The spraying of our skies MUST be stopped." And not one single reference in danes monologue, no data, no proof.....'numerous lab tests'.. where? point to one, is it so hard to paste a link?, he can manage to link to his donate button ok, maybe I will donate to his page? after all this spraying must be stopped eh? the guy's either an idiot or disinfo. Do you use 'CCleaner' and 'RegVac Register Cleaner' to get rid of all the 'trash' on your computer? If not, download both (free) and use them after every session. It will make your pc a lot faster. in this document the United States Government openly admits the existence of Chemtrails & Weather Control Weapons and more . Yes I have seen this, and the weather war documents. As i keep stressing, the fact that they are messing with the weather and spraying chemicals is uncontested. I have many pdfs on my laptop about these programs. The Department of Defense (DOD) operates a military environmental service system to provide specialized worldwide meteorological, space environmental and oceanographic analysis and prediction services in support of military forces. This system directly supports all phases of military operations, from strategic planning to tactical operations. While the Army and Marine Corps each have a small specialized weather support capability, the Naval Meteorology and Oceanography Command and Air Force Weather are the primary sources of military weather products. In addition, DOD maintains specialized observing capabilities, such as the Defense Meteorological Satellite and Global Weather Intercept Programs, to meet unique military requirements. Observational data are sent by military communications networks to military and civil facilities in the United States and overseas. What I am saying is that what most people are claiming to be chemtrails are not, they are persistent con trails. all the videos that are posted show contrails... you wont see the aerosols they use for weather control, they will be invisible......what I am also saying is that "chemtrail" web sites that claim "they're spraying our skies" are all frauds, including web sites that purport to have soil and water samples. (Vidya)What I am saying is that what most people are claiming to be chemtrails are not, they are persistent con trails. all the videos that are posted show contrails... you wont see the aerosols they use for weather control, they will be invisible......what I am also saying is that "chemtrail" web sites that claim "they're spraying our skies" are all frauds, including web sites that purport to have soil and water samples. Guess Mudra that Vidya is calling Mr. Kucinich a "liar" or "delusional"
ok, enough from me for now, I dont think I am making myself understood, though it seems clear enough to me. I am looking for proof of chemtrails, any data anyone? if there's data I will look. Vidya Moksha wrote: ok, enough from me for now, I dont think I am making myself understood, though it seems clear enough to me. I am looking for proof of chemtrails, any data anyone? if there's data I will look. I am sorry you are feeling this way. 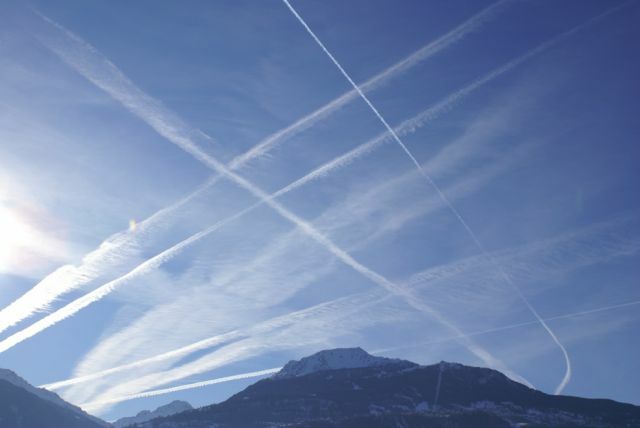 Your conclusions come after a long and thorough study on the subject of chemtrails as well as a whole load of materials you studied over time. Providing you are right you can't expect people to change their mind without going through the same process as you did would they be interested. .
Due to a poor health that's been with me for a year and a half and the resulting poisoning of chemicals I had to finally resolve myself to take to treat it , I am unable to concentrate on any serious reading for a long time. Don't expect a great and interesting debate with me these days. I am just not up to it at the moment friend . Hence my being rather laconic most of the time here on this forum. I would like to acknowledge your research though . You took it at heart. The reason I posted that reference to the Congress bill above is that I found it rather odd that Obama mentions in the things that he bans with that bill various subjects that Conspiracy sites bring in the open , chemtrails included. mine wasnt an emotive comment, Im not upset but I have nothing more to say that hasnt been said. I have no interest in changing anyone's belief systems, I am simply reporting my findings.... contradiction isnt argument (oh yes it is! <insert monty python sketch here>) so i am out of here until i, or someone, finds some data. Im sorry to hear of your illness, I have been out of the mists for a year or so and didnt notice.... I am close to setting up a forest garden here in a beautiful location, amazing wildlife and nature, clean air (as much as it can be)... come and rest a while here if you want (or bring you gardening gear ) .. i will drop you an email when i am sorted..
DID THE US AIR FORCE JUST ADMIT IT WAS USING HAARP FOR WEATHER CONTROL? The HAARP facility has been, in its own unique way, a mirror to our culture, reflecting its concerns and memes with some accuracy. Very early on in its career, Dr. Nick Begich and Jean Manning, whose book Angels Don’t Play this HAARP exposed its possible uses as a missile defense and weather modification/control technology. This, of course, was roundly denounced as more conspiracy theory crackpottery by the lamestream media, notwithstanding that it was simple physics that Begich and Manning were talking about: play around with an electromagnetic dynamic system like the Earth’s ionosphere by creating vast regions of plasma and so on within it, and,yes, one could create huge areas of low pressure and literally steer weather systems around. Perhaps…perhaps one might also set up unique standing waves within the Earth itself along fault lines, or stimulate piezo-electric effects in rocks along faults lines… The speculations grew, and even Dr. Bernard Eastland, author of some of the first ionospheric heater patents, expressed doubts in a couple of interviews about his own project, and what it might be capable of. As noted, all of this was dismissed with a laugh as the sheerest nuttery, it was “conspiracy theory.” I remember even a well-known American “conservative” talk radio host issuing a pronouncement ex cathedra on the whole matter. Infallibility is a fragile thing, however, as the following article from The Anchorage Daily News makes clear. “Comments of that sort have given rise to endless conspiracy theories, portraying HAARP as a superweapon capable of mind control or weather control, with enough juice to trigger hurricanes, tornadoes and earthquakes. This is quite an admission, for in effect, what Mr. Walker is admitting to is (1) Yes, HAARP was for manipulation and control of the ionosphere, and (2) that “work” was completed, in other words, they learned all they needed to know, and (3) they’ve moved along from proto-type technologies to “practical” technologies. There really isn’t any other viable way to construe his remarks. What Russell Blaylock, MD, retired neurosurgeon, has to say about nano-aluminum particles in chemtrails and what they can do to the human brain, especially regarding memory and learning. Aerosolized aluminum enters the brain. Nano-size aluminum particulates enter the brain even more readily. I am close to setting up a forest garden here in a beautiful location, amazing wildlife and nature, clean air (as much as it can be)... come and rest a while here if you want (or bring you gardening gear ) .. i will drop you an email when i am sorted.. These are wonderfull news Vidya. I am so happy you found a place of paradise you can now settle in. Congratulations with your project my dear and all the best with it. And thank you too for your kind invite. Sounds wonderfull. Who knows what's there in the future for me ? [b]Aerospace Engineer - I Installed Spraying Equipment On Airplanes - 12th May 2014. Its pretty hard to convince someone of this Phenomena that does not live under them day after day. That said - The understanding of how contrails occur - Their placement against what IS being seen all over the World should dictate without much need of convincing - What IS occurring and so much so that It would easily be understood what IS going on. Seriously ? You want Evidence from an Official Source or Sources about this when the Official Sources are all complicit and HAVE to be in order for Them to pull this off to the extent that It IS being reported ? Now there are some independent Labs that have produced results based on Samples but Its My bet that You won't take that as evidence either. Samples collected from individuals, entrusted to Analytika (Center for Independent Research and Expetises Organic Chemistry, located in Cuers, Var, France). Evidence was such that a French local newspaper “Le Dauphine” published the story. The report recently published by Analytika analysis provides scientific evidence of anthropogenic origin of these filaments. Among the many various known organic compounds are detected in the composition of fuels and lubricants for aircraft engines molecules, including several phthalates, “endocrine disruptors”. Location of filaments at four locations in France since the end of 2012. Data suggests no continuous release, but occasional peaks would suggest dumping of these metals or an error in the testing lab, which is actually quite common. Maybe they want to make a big battery in the atmosphere? Excellent. The data had to be there somewhere. "Vapor phase nucleation on neutral and charged nanoparticles: Condensation of supersaturated trifluoroethanol on Mg nanoparticles"
"A new technique is described to study the condensation of supersaturated vapors on nanoparticles under well-defined conditions of vapor supersaturation, temperature, and carrier gas pressure. The method is applied to the condensation of supersaturated trifluoroethanol (TFE) vapor on Mgnanoparticles. The nanoparticles can be activated to act as condensation nuclei at supersaturations significantly lower than those required for homogeneous nucleation. The number of activated nanoparticles increases with increasing the vapor supersaturation. The small difference observed in the number of droplets formed on positively and negatively charged nanoparticles is attributed to the difference in the mobilities of these nanoparticles. Therefore, no significant charge preference is observed for the condensation of TFE vapor on the Mgnanoparticles." "The nanoparticles can be activated to act as condensation nuclei at supersaturations significantly lower than those required for homogeneous nucleation." "Effect of nano-fuel additive on emission reduction in a biodiesel fuelled CI engine"
"Dec. 17, 2012 — Sulfur compounds in petroleum fuels have met their nano-structured match. University of Illinois researchers developed mats of metal oxide nanofibers that scrub sulfur from petroleum-based fuels much more effectively than traditional materials. Such efficiency could lower costs and improve performance for fuel-based catalysis, advanced energy applications and toxic gas removal." "Nanotechnology could power supersonic airplanes"
"Composed of snippets of sheets of carbon that are only a single atom thick, the particles have been shown to help fuels ignite and burn faster, a quality that could usher in the next generation of combustion engines." Global Warming is what? A carbon scam. "Founded in February 2007, Cerion Energy, a division of Cerion Enterprises, brings nanotechnology and related technologies to a broad range of markets. Developed by our team of veteran entrepreneurs and scientists/researchers, Cerion’s core competency is the consistent production of nanoparticles that are ultra-pure and uniform in size." "In addition, Cerion Energy is working on applying this technology into JP5 and JP8 jet fuels for applications of interest to the Department of Defense." I live in the Valais in Switzerland, a once beautiful area with breathtaking views, once boasting over 300 sunny blue skies a year. This was due to the fact that we are surrounded by the Alps which create a natural block to the passage of clouds. Unfortunately this is a thing of the past. We are lucky if we have 50 full blue skies a year now. In any event I have counted no less than 300 days of chemtrail spraying within the last year alone and have photo graphic evidence of each day of spraying since August 2011! 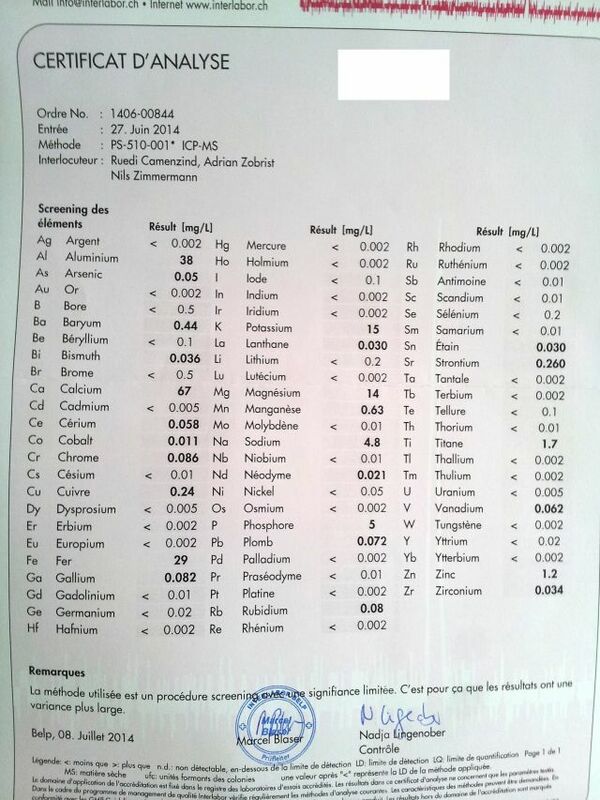 Posting this here as Barium seems to be so predominant in chemtrails. Han purple is an ancient pigment that wasn't reconstructed by modern chemists until 1992. After the chemists got done with it, it was the physicists' turn. Han purple, they found, eliminates an entire dimension. It makes waves go two-dimensional! Exactly how some inventor stumbled on a way to make the pigment is still a matter of debate. 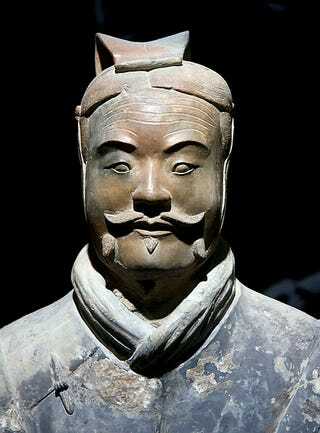 An early theory, not believed by many, is that the Chinese learned how to make purple pigment from the Egyptians. Egyptian purple pigment seems to be similar, but the chemical formulas don't add up — Egyptians used calcium instead of barium. It's also not an easy process to pass from one culture to another. To get the elements to melt together, they have to be heated to about 850-1000 °C. Most researchers think that because it contains both silicon and barium Han purple was a by-product of the glass-making process. Barium makes glass shinier and cloudy, which means this pigment could be the work of early alchemists trying to synthesize white jade. Barium copper-silicate doesn't just have archaeologists and chemists intrigued. At normal temperatures, it's an insulator and is nonmagnetic. Along with its many fine properties - prettiness, historical importance, a hint of aristocratic style — barium copper-silicat has many electrons, some of which spin up and some of which are spin down. Something unusual happens as the temperature drops and as a magnetic field is applied, although the temperature has to drop pretty far, going down to between one and three degrees Kelvin, and the magnetic field has to be about 800,000 times the strength of Earth's magnetic field. The results are worth it — the electrons seem to merge, taking on one spin, and acting as one electron. “This documentary is dedicated to everyone who wants to fight for truth and life on planet Earth. Let's stand up and defend our rights ! " Antonio and Rosario Marciano.